"It works! So far I am pleased with this product. It's not too tough on my skin and is brightening it just the same." Stacey B. 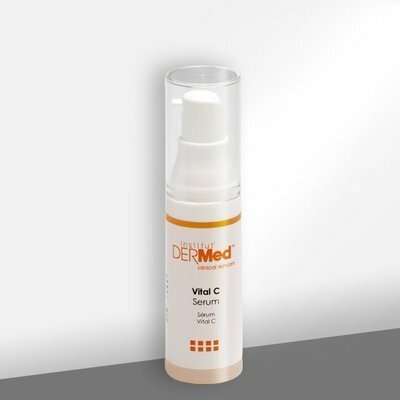 The Institut' DERMed Vital C Serum is an advanced serum formulated with L-Ascorbic Acid and Resveratrol to improve reliliency of the skin, diminish the signs of aging and reduce the look of age spots for a luminous, more youthful looking complexion. A serious skin brightening serum formulated without: parabens, mineral oil, sodium lauryl sulfates, phthalates, artificial dyes or synthetic fragrances. Products not tested on animals. For best results, use three times a week in the morning and/or evening. Follow with the Institut' DERMed Brightening Moisturizer. You may experience mild tingling or redness. This is normal and should be temporary until your skin adjusts. Resveratrol Wine Extract - anti-oxidant for a luminous complexion. Vital C (L-ascorbic acid) a potent antioxidant for healthy radiant skin. Hamamelis Virginiana (Witch Hazel) Water, Glycerin, L-Ascorbic Acid, Aqua (Water), Xanthan Gum, Sodium Chloride, Fructooligosaccharides (D-beta), Glucosamine HCL (D), Wine Extract.